I wasn't so sure about Bring Me Back at first. I started reading it right after The Breakdown, and that book was so stunning and amazing that this one didn't quite catch me in the same way, at least not in the beginning. I worried I wouldn't end up liking it, but I soon found myself caught up in the story. If you've happened to read any of my reviews, then you know I love unreliable narrators, and Finn definitely isn't someone I trusted all the way. I knew some of his POV was leaving out parts of the truth, and I spent a good deal of time thinking about what those missing parts in his story could be. Bring Me Back was going to be a three star read for me, but the ending was so surprising it made this book four stars. 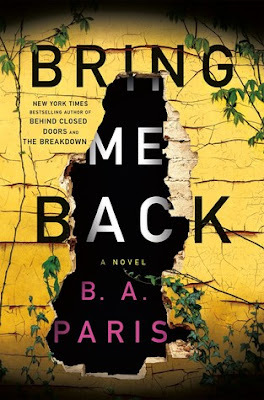 I loved Paris's writing and characters, just not as much as her first two books. But that ending though! I'm stoked to see what Paris releases next. She's become one of my auto-buy authors, and in the meantime while I'm waiting, I'll likely reread her books again. Sometimes the ending makes the book worth reading. So true! That's why I can never seem to DNF a book - I'm always worried I'll miss a great ending.